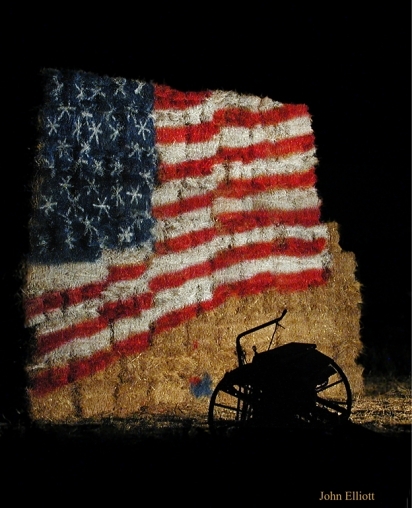 In a patriotic response to the 9/11 disaster, the owner of the Buhrmaster Farmstand on Rt 50 in Glenville created this stack of 800 bales of straw and painted the flag onto it. I was trying to capture the stack at sunrise when he drove up and suggested that it looked very nice at night. So that night I visited and discovered the farm equipment that could form a silhouette in the foreground. He sold many prints of the picture at the farmstand with the proceeds to benefit the costs of recovery.